DROID 4 delayed until February? | Android Blast! Android Blast! > News > DROID 4 delayed until February? DROID 4 delayed until February? The world was expecting to see Verizon's DROID 4 launch this week, but it looks like the Motorola Android handset has been delayed. 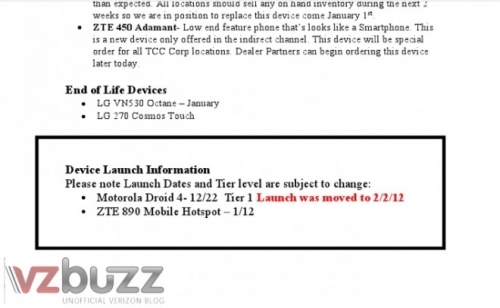 A leaked Verizon doc indicates the DROID 4 will not launch until February 2, 2012. That's a huge bummer for those waiting for the 4th installment of the DROID. There is no reason given for the delay, but it was believed that an LTE outage caused the Galaxy Nexus delay. Could this be the same thing going on again? Could they be holding the DROID 4 so that they can ship it with Ice Cream Sandwich? Stay tuned.